← Why Did Knights Joust Snails and Lose So Often? There are a large number of forces at work in the Universe, some more powerful than others — and I’m not talking about the four fundamental forces of nature. A force in the context I’m talking about is any phenomenon in Universe that exhibits a powerful effect or influence on its environment. Many of these phenomenon quite obviously depend on the four basic forces to function (gravity, electromagnetism, the weak interaction and the strong interaction), but it’s the collective and emergent effects of these fundamental forces that I’m interested in. And when I say power I don’t just mean the capacity to destroy or wreak havoc, though that’s an important criteria. A force should also be considered powerful if it can profoundly reorganize or manipulate its environment in a coherent or constructive way. There’s no question that black holes are scary; it’s the only part of the Universe that can truly destroy itself. Indeed, Einstein himself, whose Theory of Relativity opened the door to the modern study of black holes, noted that “they are where God has divided by zero.” And it’s been said that the gravitational singularity, where the laws of physics collapse, is the most complex mystery of science that still defies human knowledge. 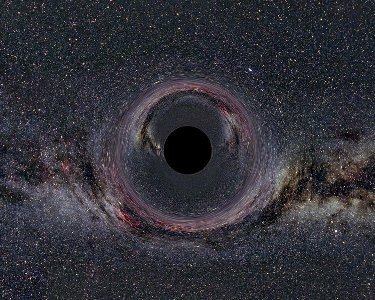 Somewhat counterintuitively, black holes take the weakest of the four basic forces, gravity, to create a region of space with a gravitational field so powerful that nothing, not even light, can escape its pull. They’re called “black” because they absorb all the light that hits them and reflect nothing. They have a one-way surface, the event horizon, into which objects can fall, but out of which nothing (save for Hawking Radiation) can escape. That’s a lot of pull. Imagine a hypergiant star at the end of its life, a massive object that’s 150 times larger than our own. Extremely high levels of gamma radiation from its core is causing its energy to transform to matter. The resultant drop in energy causes the star to collapse. This results in a dramatic increase in the thermonuclear reactions that was burning within it. All this added energy overpowers the gravitational attraction and it explodes in a fury of energy — the hypergiant has gone hypernova. This is not the stuff of fiction or theory — explosions like this have been observed. 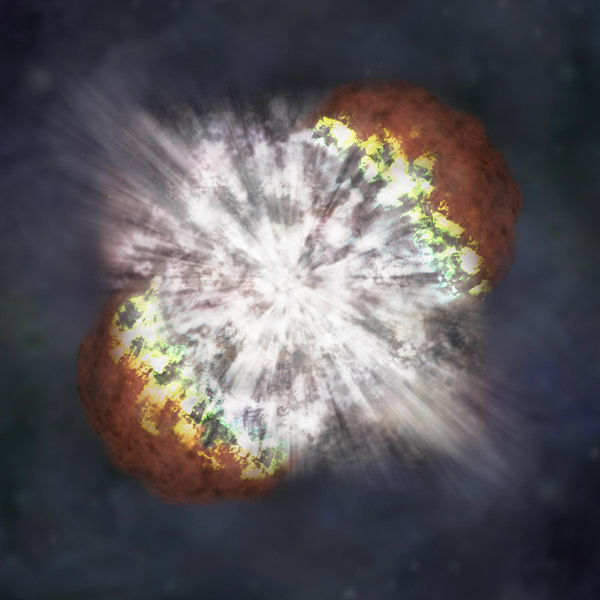 Hypernovas of this size can instantly expel about 10X46 joules. This is more energy than our sun produces over a period of 10 billion years. 10 billion years! In one cataclysmic explosion! We are currently able to detect an average of about one gamma-ray burst per day. Because gamma-ray bursts are visible to distances encompassing most of the observable Universe — a volume encompassing many billions of galaxies — this suggests that gamma-ray bursts are exceedingly rare events per galaxy. Determining an exact rate is difficult, but for a galaxy of approximately the same size as the Milky Way, the expected rate (for hypernova-type events) is about one burst every 100,000 to 1,000,000 years. Thankfully, hypergiant Eta Carinae, which is on the verge of going nova, is well over 7,500 light years away from Earth. We’ll be safe when it goes off, but you’ll be able to read by its light at night-time. But not so fast — our safety may not be guaranteed. Some scientists believe that gamma-ray busters may be responsible for sterilizing giagantic swaths of the galaxy — in some cases as much as a quarter of the galaxy. Such speculation has given rise to the theory that gamma-ray bursters are the reason for the Fermi Paradox; exploding stars are continually stunting the potential for life to advance, making it the 3rd most powerful force in the Universe. While this might not seem so impressive or powerful in its own right, it’s the complexification and the emergent effects of this process that’s interesting; what began as fairly straight forward cellular replication, at least on Earth, eventually progressed into viruses, dinosaurs, and human beings. Self-replicating RNA/DNA has completely reshaped the planet, its surface and atmosphere molded by the processes of life. And it’s a process that has proven to be remarkably resilient. The Earth has been witness to some extremely calamitous events over its history, namely the Big Five Mass Extinctions, but life has picked itself up, dusted off, and started anew. Autotrophic replicators: Devices that could reproduce themselves in the wild and mine their own materials. It’s thought that non-biological autotrophic replicators could be designed by humans and could easily accept specifications for human products. 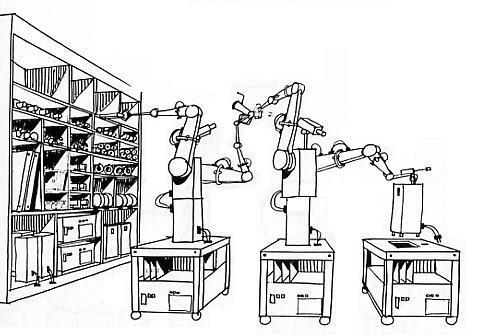 It’s conjectured that a particularly potent form of self-replication will eventually come in the form of molecular manufacturing and the introduction of self-replicating nanobots. One version of this vision is connected with the idea of swarms of coordinated nanoscale robots working in tandem. Microscopic self-replicating nanobots may not sound particularly powerful or scary, but what is scary is the prospect for unchecked exponential growth. A fear exists that nanomechanical robots could self-replicate using naturally occurring materials and consume the entire planet in their hunger for raw materials. Alternately they could simply crowd out natural life, outcompeting it for energy. This is what has been referred to as the grey goo or ecophagy scenario. Some estimates show, for example, that the Earth’s atmosphere could be destroyed by such devices in a little under two years. And of course, if you can build you can destroy; the same technology could be used to sterilize the Galaxy in the same amount of time [for more on this topic read my article, “Seven ways to control the Galaxy with self-replicating probes“]. Humanity, a particularly intelligent bunch owing to a few fortuitous evolutionary traits, has — for better or worse — become a force of nature on Earth. Our species has reworked the surface of the planet to meet its needs, significantly impacting on virtually every other species (bringing many to extinction) and irrevocably altering the condition of the atmosphere itself. Not content to stay at home, we have even sent our artifacts into space and visited our very own moon. While some cynics may scoff at so-called human ‘intelligence’, there’s no denying that it has made a significant impact on the biosphere. Moreover, what we think of as intelligence today may be a far cry from what’s possible. The advent of artificial superintelligence is poised to be a game-changer. A superintelligent agent, which may or may not have conscious or subjective experiences, is an intellect that is much smarter than the best human brains in practically every field, including problem solving, brute calculation, scientific creativity, general wisdom and social skills. Such entities may function as super-expert systems that work to execute on any goal it is given so long as it falls within the laws of physics and it has access to the requisite resources. That’s power. And that’s why it’s called the Technological Singularity; we have no idea how such an agent will behave once we get past the horizon. Another more radical possibility (if that’s not radical enough) is that the future of the Universe itself will be influenced by intelligent life. The nature of intelligence and its presence in the Universe must always be called into question. There exists only one of two possibilities: intelligence is either 1) cosmological epiphenomenon, or 2) an intrinsic part of the Universe’s inner workings. If it’s the latter, perhaps we have some work to do in the future to ensure the Universe’s survival or to take part in its reproductive strategy. Theories already exist in regards to stellar engineering — where a local sun could be tweaked in such a way to extend its lifespan. Future civilizations may eventually figure out how to re-engineer the Universe itself (such as re-working the constants) or create an escape hatch to basement universes. 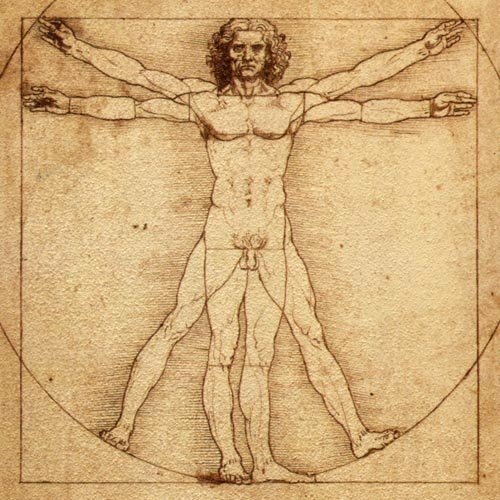 Thinkers who have explored these possibilities include Milan Cirkovic, John Smart, Ray Kurzweil, Alan Guth and James N. Gardner (for example, see Gardner’s book Biocosm: The New Scientific Theory of Evolution: Intelligent Life is the Architect of the Universe).